Cedarwood is a Winter sports enthusiests delight as we are located near the snowmobile trail. Ride through the woods in the backyard to gas up your sleds and enter Penninsula State Park across from the station. After cross country skiing, snow shoeing, sledding or snowmobiling warm up in front of the fireplace in our spacious great room. We look forward to hearing from you soon! I grew up watching & helping my parent's and sister purchase Door County real estate below market value, renovate, furnish and turn their properties into vacation rentals while building equity. After seeing their success I knew this was always a dream of mine. In September of 2007 our opportunity arose and we wasted no time getting busy! HGTV is one of our favorite networks and we had 10 months to put our knowledge and skills to work. We are happy to share our results with you and are confident you will return to Cedarwood as your Door County vacation getaway! Location, location, location... Cedarwood is in a quiet residential area, yet the Door Community Auditorium, the Northern Door YMCA and Top of the Hill shops are a 5 minute walk away. Downtown Fish Creek with it's numerous restaurants, shops, fine galleries, public beach and Peninsula State Park are a 15 minute walk away. One can come back home to Cedarwood to relax and unwind in a peaceful setting away from the hustle and bustle of downtown. Cedarwood is great space for families to reconnect while on vacation. There is plenty of room to relax and unwind with enough space allowing for privacy. We carefully thought out what type of amenities would make your stay pleasant and went to work providing them. Cedarwood has 2 TV viewing areas with flat screen HD TVs allowing children to watch a movie while their parent's enjoy watching a game, DVD or favorite show. We maintain an extensive children's movie and cartoon selection. The yard is very spacious and has a bonfire pit which is perfect for making smores. We have plenty of dishes for family dining & a new dishwasher to make clean up a breeze. Laundry facilities are available too, along with 3 grills for cooking out while the family plays croquet. We provide plenty of information on Door Co., brochures, menus, books, magazines and maps to assist in planning your daily activities. We also have Wi-Fi connectivity. Garage is used for storage and is not available. Please bring your own beach towels as they are not furnished. 500 square foot great room with cathedral ceilings, fire place with gas stove, and HD flat screen TV. HD cable with two seperate TV/movie viewing areas. Spacious yard with croquet and bon fire pit. Front yard features a stone patio/patio door off of the great room. Back yard features a wooden deck, spacious yard with picnic table and cedar swing. We snuck away for a long weekend in one of our favorite places to do some hiking, biking and see some fall colors. We really enjoyed Cedarwood - location just outside of Fish Creek is perfect, comfortable and homey - just right for us. While there were only 3 of us, Cedarwood would easily accommodate another couple or two - next time we hope our friends will join us ... yes, we'll be back. Many thx to the Marr's - they are really gracious owners - responsive with questions and very accomodating - thx to you both! Plenty of room for our girls trip!! We were VRBO virgins but would definitely stay again. 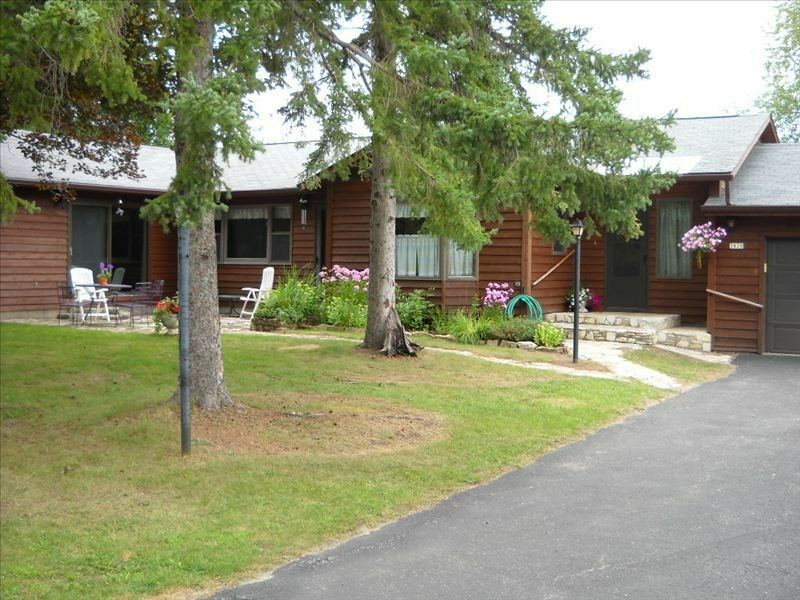 Great place and great location for your Door County vacation. Cedarwood is a great place to stay in Door County!! Love the location!! The house is very clean and well equipped with everything you’ll need. VERY happy with the property! We were disappointed that is wasn't within easy walking distance to the shops and restaurants in Fish Creek. Otherwise....spacious, well equipped, comfortable and quiet. We enjoyed it very much! Will definitely stay again! This is the third time our group has had the privilege of staying at Cedarwood. It works perfectly for us. This time we were able to take advantage of the fire pit in the back yard - relaxing with friends, watching a crackling fire and the amazing stars, what better way to end a Friday night? It is very well kept-up and the amenities are wonderful. Saturday night we laughed the night away playing "Balderdash" - which was supplied in the house. Thumbs up all around. Can't wait for our next stay there! The home was Great, lots of space, great yard lots of privacy, we saw deer and an eagle. Very turn key everything we needed was there. Thanks so much. Walking distance to Northern Door YMCA, daily, weekly and family passes are available. Take advantage of their pools, hot tub, sauna, classes and weight room. November 1 - May 31, rent 3 nights and get one night FREE. Please enter 3 nights, and e-mail me the date of the extra night that you would like FREE. Please double check our calendar to make sure that your extra night is available so we may honor your request. Holidays and festival weekends require a 3 night minimum. Check-in time is 3 pm, check-out time is 10 am.